As soon as I said the name of this recipe out loud, my boyfriend said something like "that sounds amazing." 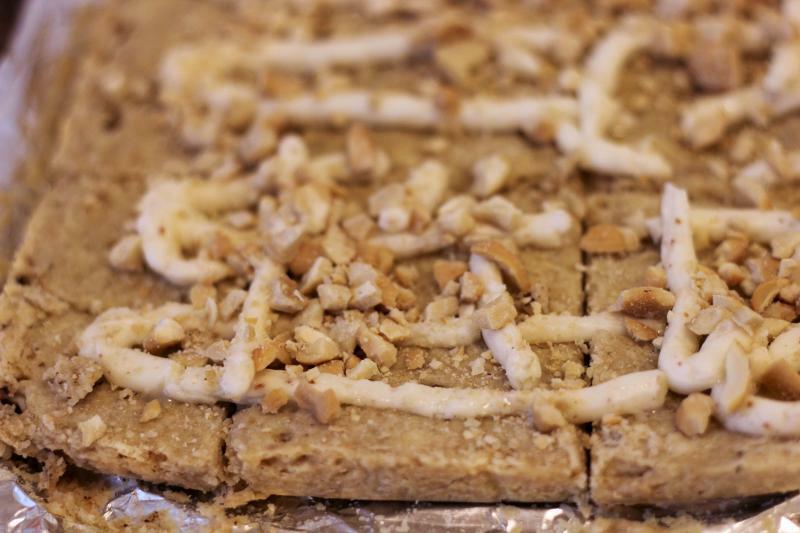 And I have to agree, anything that has brown butter in cashews in it sounds pretty dang awesome. He is also a big fan of shortbread in general, and has been eating cashews with abandon lately. So is the recipe a winner? Well, the glaze ended up being more like frosting than a typical glaze when I made these, as I only had heavy cream rather than milk. You would think that wouldn't make much of a difference, but as you can see, it was pretty thick! And, pro tip - adding water will not help matters! It won't incorporate and will just make the glaze stuff a bit weird. So, yes, milk. Get milk. 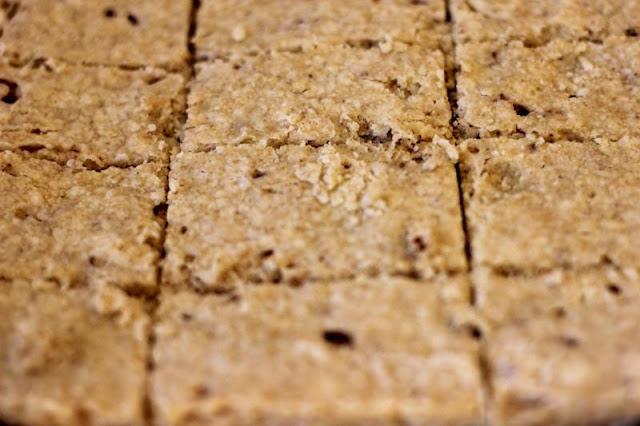 The shortbread itself is pretty crumbly, and a very simple recipe, as you can see below. Normally I would say shortbread on its own can be pretty good, but in this case I would say the frosting is actually really needed here. It adds some needed sweetness to an otherwise very pie-dough type shortbread. The frosting on its own seems way too overpowering, but the two together work quite nicely. I apologize for the pictures not being hugely amazing. Been having some camera difficulties lately and was trying a different lense, which wouldn't zoom in quite so close as I am used to. I also was just not feeling up to going full-on food prettifier. Not that I'm the best at that in the first place, but oh well! Hope you enjoy anyway! Line an 8x8 inch pan with foil, extending the foil over the edges (makes it easier to pull it out later). In a medium saucepan, brown the butter. Remove from heat, and cool slightly. Set aside 2 tablespoons for later. Stir in vanilla into the remaining browned butter. Chill that for at least an hour until firm (easiest in the freezer). Preheat oven to 325F. In a medium bowl, stir together the flour and brown sugar. Using a pastry blender, cut in the chilled brown butter until it resembles fine crumbs. Press the dough firmly into the bottom of the prepared 8x8 pan. It will be pretty dry but the butter bits will expand as it bakes, don't worry. Bake for about 25 minutes until the shortbread is firm but not brown. 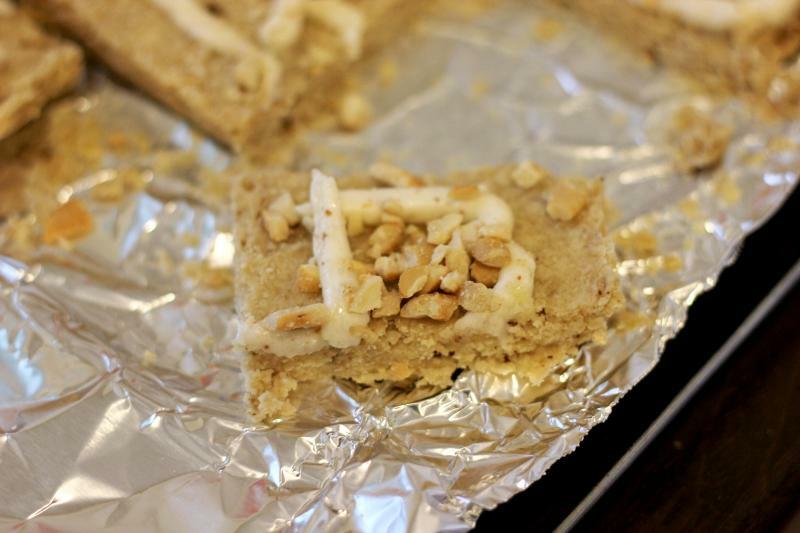 Immediately lift the bars out of the pan using the foil, then cut them into bars. Transfer the bars on the foil onto a wire rack to cool completely. For the icing, stir together the 2 tablespoons of brown butter you saved from earlier (best if it is melted), the powdered sugar, and enough of the milk to make it more of a glaze. Drizzle that over the cooled shortbread, then sprinkle with cashews. Enjoy!